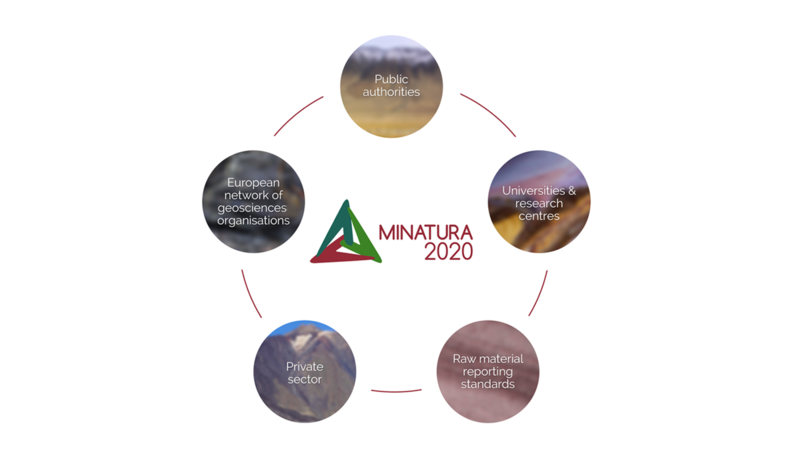 Public authorities in charge for raw materials data, policies and planning in their respective countries are strongly represented in MINATURA2020. A Ministry of Economy (MGHBZ), governmental authorities and geological surveys (ZGI, MGHBZ, MFGI, GeoZS, GSSK, GSBU) bring authority and state-of-the-art knowledge on relevant raw materials policies, practices and data. In particular, the participating geological surveys provide knowledge on mineral availability and utilisation (including environmental aspects) covering surface, underground and subsea mineralisation. This knowledge is enhanced by the participating universities and research centres that represent scientific excellence (MEERI PAS), bringing into the project a multi-disciplinary knowledge-base that covers law & policies (UCL), economics (LTU), land-use (ALTERRA), primary resource utilisation on land (UBU, UdL, UoB) and primary resource utilisation in marine environments (UCC). An “umbrella” on raw material reporting standards will be provided by PERC. The private sector is well-represented in the project for the reason that the expected raw material development activities in Europe will offer new business/consulting opportunities for industrial stakeholders and small and medium-sized enterprises (SMEs) as well. Companies are represented via an industry association (IMA-EUROPE), several SMEs with a track-record of minerals-related studies and awareness raising activities towards the need of raw materials development in Europe (MinPol, CF, MRPA, ISKRIVA). Project dissemination activities will be strongly supported by the European network of geosciences associations represented by the European Federation of Geologists (EFG). The project work is divided in seven work packages (WPs), five thematic and two supporting ones. At the beginning of the project, WP1 will proceed with a land use assessment, exploring current and future land use competition between mining and other land uses, based on existing methodologies and approaches at EU and national level. The land use competition assessment will provide a relevant overview for developing the concept and definition of the Mineral Deposits of Public Importance (MDoPI) and the Harmonised Mapping Framework in WP2. The main objective in WP2 is to establish an appropriate mapping framework based on detailed qualifying conditions for classifying mineral deposits of public importance. This is aimed at developing a concept of a potential EU directive on protecting and safeguarding MDoPI, including an Annex defining qualifying conditions for MDoPI. In WP2, the term “mineral deposits of public importance” will be defined in order to ensure its general applicability on the EU, member states, regional or local level. Building a common ground will include reviewing existing good practices of mineral resources planning policies across the EU. The draft concept of MDoPI and framework methodology will be reviewed at the national and regional level (WP3), demonstrated in operation (WP4) and in parallel consulted with stakeholders (WP5). Finally, results of all WPs will feed back to WP2 that will conclude the project with the final Harmonised Mapping Framework. WP3 will deal with the regulatory framework by identifying gaps and good practices in the regulatory framework on national/regional and local levels. The objective of WP3 is to support the designation of the best method to incorporate the concept ‘mineral deposits of public importance’ into the national/regional regulatory framework, minerals policies as well in land use planning policies of different scales through different policy scenarios and their impacts. The aim of WP4 is to demonstrate/test the developed methodology in selected partner countries, taking into account different national policy scenarios and their impacts to ensure robustness at all levels (local, regional, national and EU), and for transferability across all members. As a horizontal supporting activity, involvement of stakeholders will be crucial at all stages. In WP5, the proposed aspects of all preceding WPs will be consulted with stakeholders: proposed MDoPI concept, mapping framework/qualifying conditions, the land use planning basis, applicability to the national/regional/local level and the pilot testing requirements. Firstly, guidance for planning the involvement of stakeholders and analysing them will be prepared. Secondly, one partner in each participating country will organise three rounds of consultations in line with the project flow. The feedback from consultations will be summarised, analysed and used to adapt/improve the developed concepts and guidance. Finally, the stakeholders’ networks will be gathered in the Council of Stakeholders at the national and EU (umbrella) level, in order to keep the network functioning with the aim of providing a platform for future operation of the MDoPI mapping framework in each EU country. The project implementation will be supported horizontally through dissemination activities (WP6) and coordination and project management (WP7).